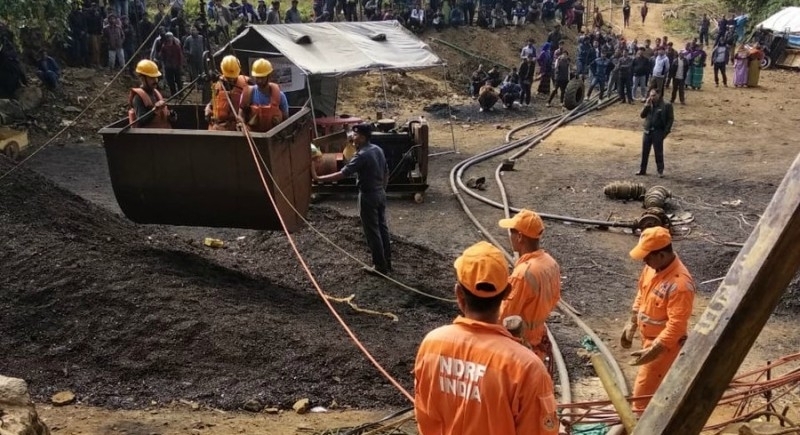 Guwahati, February 9: As the state of Meghalaya is struggling day in and out in a tedious operation to rescue trapped miners, the Supreme Court has issued notice to the owner of the coal miner for being responsible for the mishap. Judges AK Sikri and Abdul Nazeer also asked Meghalaya government and Coal India Ltd to give particulars of other in the area. Despite a four year ban on mining by the National Green Tribunal, 13 miners were trapped in the Ksan village, Meghalaya, were illegal mining activity was underway. Asserting sweating situations, the mission to rescue these trapped miners is underway. The rescue teams have so far been able to recover only three helmets. The 13 miners are trapped in the rat-hole mine in Meghalaya since December 13. The mine is 370 feet deep and the flood level is estimated to be 70 feet. A pumping unit has been pressed into action to reduce the water level. Two teams of NDRF, comprising 60 personnel and 12 rescue workers of the SDRF are trying to evacuate the trapped miners. With the intense efforts to rescue them, unfortunately the team could not trace them so far. On a recent development the Indian Navy and an Army team of 20 to 25 personnel has been deployed to assist Navy operations in the mine. The Defence Ministry official informed that this is only administrative support to the Navy in case need be, for efficient, smooth and round-the-clock operations. He said that the soldiers will provide logistical support to the Navy.